I wrote about Computer Aided Design Tools (CAD) for business people years back in my doctoral dissertation. 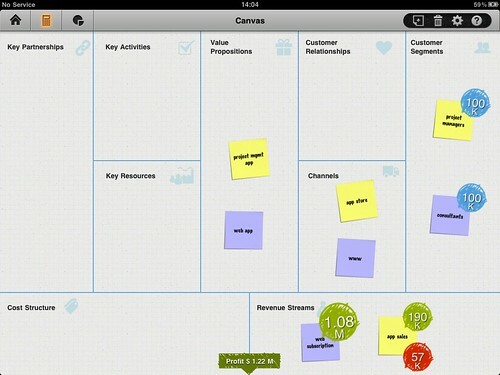 With the Business Model Toolbox for iPad we now made the first concrete steps towards a whole new breed of computer aided business design tools. 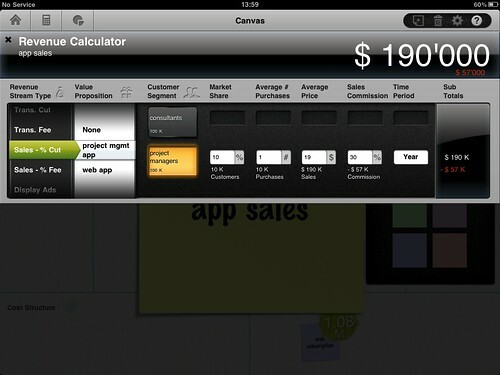 The Toolbox combines the speed of a napkin sketch with the smarts of a spreadsheet. It enables you to map, test, and iterate your business ideas — fast. It always struck me that we have relatively few good software tools in business to think through more strategic issues. We do have sophisticated business analytics tools to make sense of large amounts of quantitative data. We do have spreadsheets to simulate complicated financial scenarios. Yet, what do we have today to design and test strategies and business models? Little. That’s exactly why the team behind the bestselling book Business Model Generation developed the Business Model Toolbox for iPad (V.1.0.) together with Geneva-based development firm Hortis le studio. Sketch your business model using the practical methodology from the best-selling book, Business Model Generation. 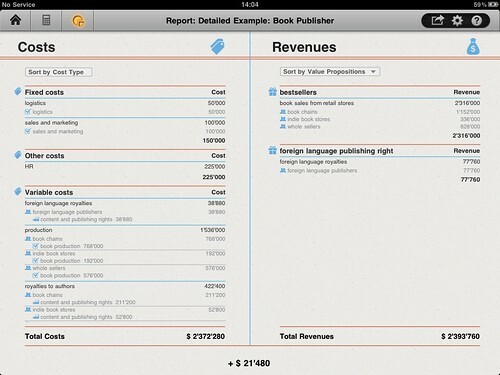 Add ballpark figures for market size, revenue streams, and costs — faster than any spreadsheet. Test the profitability of your ideas with a quick report and breakdowns by offer, customer segments, and costs. 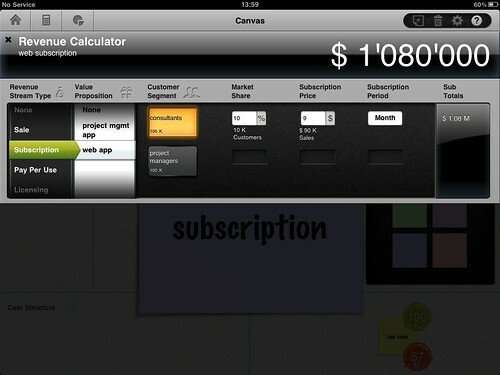 Playing with revenue stream ideas: what about a Web subscription? Obviously, many people asked us why just for the iPad. As soon as we launched they immediately asked for Android and Web versions. From a business perspective it might have indeed been smarter to start with a Web app because of its broader reach. This is particularly true, since we started developing the Toolbox when it was far from clear if anybody would buy an iPad. The reason we went for the iPad first is because I firmly believe that the touch interface and the relatively large screen of the iPad will allow us to demystify and democratize the prototyping of business models - just like the visual design of the Business Model Generation book helped demystify and democratize business model thinking and thus make it accessible to a larger audience than the usual business book readers. By going for the iPad first and the Web second we wanted to show what's really possible when it comes to prototyping business models. Using your fingers to pull in virtual sticky notes just feels so much more natural than using a computer mouse, doesn't it? The iPad app allowed us to test and validate this theory. Today there are about 19 million iPads in the market (read more) and there is no doubt that Apple is currently dominating the tablet market. More interestingly, a majority of the senior executives and entrepreneurs I work with have an iPad. Some of them even bought an iPad just to use the app. For all others we will have good news later this year. The Business Model Foundry will continue to develop breakthrough tools for the Business Model Generation. PS: Here at Process World 2011 in Berlin where I currently am at I'll give a keynote about bridging the gap between business strategy and processes through the Business Model Canvas. Already, Software AG, one of our partner companies and organizer of Process World, has integrated the Business Model Canvas into ARIS, their business process management tool (read more).